You want to keep the dive line next to you so you can make sure you duck dive ahead of the line by about a meter. This ensures that when you duck dive you are automatically facing the dive line and close enough for there to be no drag from the lanyard running along it. If, when you duck dive, you cannot immediately see the line, then get your instructor or buddy to take a look and see where in relation to the line are you starting the dive. After taking your final breath, remove your snorkel and perform an equalization. One of my instructors coined the term ‘pre-equalization’ as it slightly inflates the eardrums outwards before the dive. You may find that you do not need to do this pre-equalization, however pressure changes are the most intense in the first 10 meters and you may find that this pre-inflation of your ears helps you last until your first equalization of the dive, which can come as late as 4 or 5 meters deep. The moment your legs are vertical, bring both arms back to the side of your body in a scooping, breaststroke movement, before bringing one hand to your nose to equalize and then keeping it there (more on this in the chapter on equalization). We’ve covered correct weighting in another article, but it is important to mention that many beginner freedivers and spearfishers compensate for poor duck dive technique by over-weighting. The moment excess weight is taken off them, they fail to leave the surface in a graceful fashion. My instructors will then perform a duck dive with no weight, just to show them that it can be done! 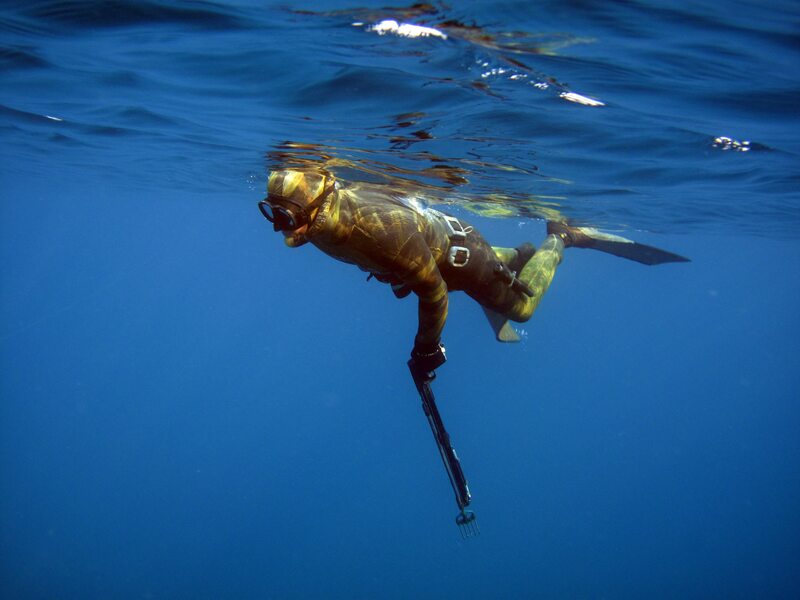 If you are holding a spear gun or camera then it can be difficult to use both arms to pull with once your legs have been raised. Ensure that the rest of your technique is perfect and only pull with one arm unless your camera is small as you don’t want to bash yourself in the head with it. The most important thing is to get under the water expending the minimum amount of energy. Spearfishers sometimes use a technique whereby the legs are spread and only one lifts out of the water, creating as little disturbance as possible when leaving the surface. This is fairly easy when you are wearing a lot of weight and is a technique that can be adopted when shallow spearing. However, it is still possible to duck dive with both legs coming vertically out of the water with almost zero water disturbance if the correct technique is applied. 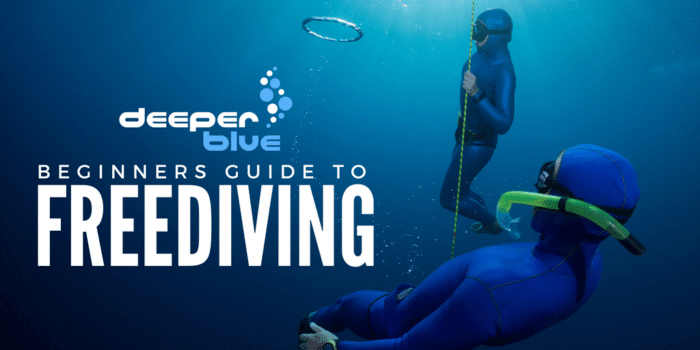 If you are diving with a nose clip then you will not need to pre-equalize or use your hand, as you can equalize against the nose clip whenever you need to. You may find that if you are diving with a monofin you want to keep your arms above your head for the duration of the dive. Just ensure that your monofin is completely below the surface before you start to fin. Why do you spit the snorkel out? I leave it in so I can use the displacement clear while surfacing. (Instead of blast clear). 2) If you do black out with a snorkel in your mouth then your jaw could clamp shut, impeding rescue and revive attempts. Isn’t it better to do a smooth duck dive without lifting your legs out of the water? It will save some necessary oxygen. A few thoughts relative to the comments. First – a different perspective on Snorkel in or out. I ‘discovered’ snorkel out one day while diving, before I knew anything about the various reasons Emma mentioned. I took my snorkel out during a dive and immediately felt much more relaxed, focused, at ease and part of the environment. I have since changed the type of snorkel I use partly based on this, and the fact that I normally swim with a monofin. I even did a series of test dives to confirm it because, at the time, I thought it was more logical to have it in. On another note; I’ve a friend who became separated from his group and suffered a serious blackout in open water. When he came too he was face down, breathing through his snorkel. He had in fact aspirated water and was barely able to get enough O2 to remain conscious. Fortunately the dive boat noticed he was in distress and took him ashore where he spent two weeks in the hospital due to pneumonia caused by aspirating so much water through his snorkel. The question there is – would he even have survived without the snorkel in? On Duck Dives – it’s a trade-off between the downward momentum you gain and the O2 you consume. Legs out will obviously drive you much deeper more quickly. One leg works, as Emma mentioned, depending on your weighting (and assuming you are not using a monofin!). If you are diving in relatively shallow water and are weighted for that. Fighting buoyancy with kicks is much more energy consuming than raising the legs for a duck dive. FRC diving is a good example of the Trade-off philosophy.